At Doha Climate Talks, Modest Results At Best Diplomats in Doha, Qatar, are working late into the night to hammer out a deal in the 18th round of U.N. climate talks. Expectations are low as the talks are part of a multiyear process to make a transition from the fading Kyoto climate treaty to something that engages all nations of the world. 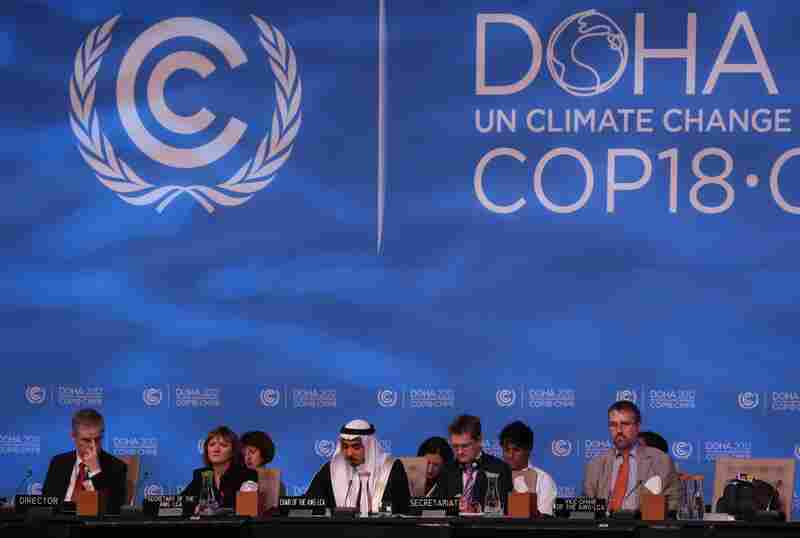 Delegates attend the last day of the U.N. climate talks in Doha, Qatar, on Friday. U.N. climate negotiators locked horns on the final day of talks in Doha to halt the march of global warming, deeply divided on extending the greenhouse gas-curbing Kyoto Protocol and funding for poor countries. United Nations climate talks ran into overtime on Friday night, as diplomats pressed for whatever small advantage they could achieve. As usual, the talks, which are being held in Doha, Qatar, involve closely interwoven issues. They include the usual wrangling over money, as well as early efforts in a multiyear process that is supposed to result in a new climate treaty. Part of that involves finding a graceful way to phase out the Kyoto treaty, which has not proved to be a successful strategy for dealing with a warming planet. This is the 18th round of climate talks. One new issue on the table this year is a question of how rich countries should help poor countries respond to climate-related disasters. "There must be a mechanism of really addressing this issue," said Pa Ousman Jarju, a diplomat from Gambia who speaks on behalf of some of the world's poorest nations. "We have heard in the news, in the United States they are mobilizing over 80 billion U.S. dollars for Hurricane Sandy," he said. But many nations in the world simply don't have the resources to cope with disasters of that magnitude. So the world's poor countries say there should be a special fund created to deal with losses and damage caused by typhoons and droughts. No big surprise — the countries that would be expected to fill those coffers are not so interested in creating a new fund. "This basically would set up a liability structure about who is liable for climate change," said Jennifer Morgan, of the World Resources Institute, in a telephone interview from the halls of the conference center. "And while I think that's a very important question for people to answer, I don't think the world is ready for that yet." In fact, wealthy nations are feeling a bit broke and have shown little interest in ramping up their donations to existing aid funds. At the meeting in Copenhagen three years ago, these countries agreed to increase climate-related funding to $100 billion a year by 2020 (in both government funds and private investment). But "there's no bridge, no pathway between now and the $100 billion number," Morgan says. "So one of the real crunch issues here, which I think will determine whether we will get out of the building with an agreement or not, is whether developed countries are ready to at least say that they're going to match what they've been providing thus far." That's been $30 billion over the past three years. And Celine Chaveriat from the aid group Oxfam says it's not just an issue of money; it's a matter of keeping to one's commitments, "and so opportunity to build trust here in Doha, and they're completely failing." Money isn't the only complication. Diplomats are also trying to come up with a single climate treaty that will guide all nations, starting in the year 2020. Right now, there's a hodgepodge, including the Kyoto treaty, which was negotiated in 1997 but by now only engages a small number of nations. The hope is that a new pact will include much stronger pledges for reducing carbon emissions. Current pledges, made at the talks in Copenhagen three years ago, are still far short of what's needed to stabilize the planet's atmosphere. "There's no new ambition since Copenhagen, and that's very worrying," Morgan says. This is a matter of survival for small island nations, which could disappear under the waves in the next century if sea levels continue to rise. But frustrating as the United Nations process is to Tony deBrum, who represents the alliance of small-island states, he isn't about to give up on these cumbersome U.N. talks. "The engagement that this platform affords small countries is essential to our survival," he says. "Because if we don't have this platform, what do we have?" That's no doubt on the minds of many negotiators as they confront another very late night of talks, which will yield, at best, very modest results.